When you apply a PLDT landline you can also enjoy other services if you want, like NDD calls, call to mobile phone numbers, call forwarding and more. These landline features can be loaded during applications and some are not but you can still activate it if you want by calling PLDT Customer Hotline Number. One of the important features on PLDT landline that you can make use of is the call forwarding. You can mostly use this on small business or even personal. This feature gives you ease when it comes on handling calling while you away from your office or you’re on travel. By just following the few steps below you can activate the feature manually or you can call PLDT and let them do it for you. Call forwarding Immediate – This feature will forward all incoming calls are automatically forwarded to the pre-programmed number whether or not the phone is being used. 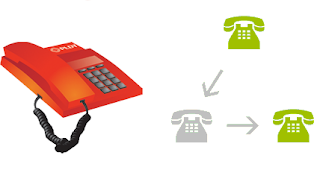 Call forwarding Busy Only - This feature will divert all incoming calls to the pre-programmed number when the forwarded number is in busy condition. Call forwarding No Answer – All incoming calls are diverted to the pre-programmed number when no one answers the call after the fourth ring. Note that these features has one time activation and monthly charge, please call PLDT if you have more inquiries about call forwarding activation, deactivation and charges. You can also visit www.pldthome.com.